ec-europe has created this Diabetes Foldout Brochure, to help train both patients and their families regarding diabetes, as well as to help doctors explain all the facts patients should know about this disease. Type 1 diabetes mellitus (T1DM), one of the most common chronic diseases in childhood, is caused by insulin deficiency following destruction of the insulin-producing pancreatic beta cells. T1DM is a disorder that disrupts the way your body uses sugar. All the cells in your body need sugar to work normally. Sugar gets into cells with the help of a hormone called insulin. If there is little or no insulin, as it happens to people with T1DM, sugar builds up in the blood. High blood sugar can cause serious problems over time. It can lead to nerve damage, kidney disease, vision problems (or even blindness), pain or loss of feeling in the hands and feet, the need to have fingers, toes, or other body parts removed (amputated) and heart disease and strokes. It most commonly presents in childhood, but one-fourth of cases are diagnosed in adults. 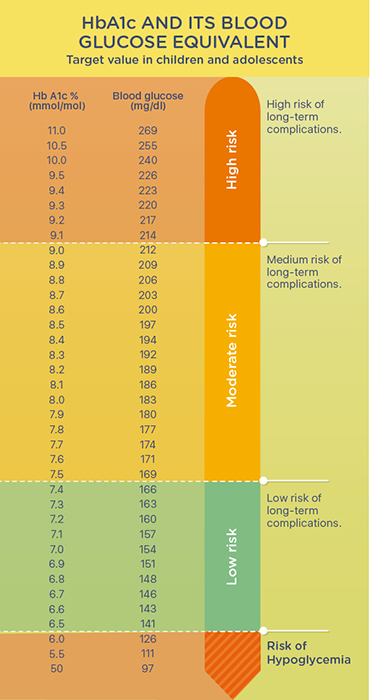 T1DM is the most common form of diabetes in childhood, accounting for approximately two-thirds of new diagnoses of diabetes in patients ≤19 years of age in the United States. The incidence of childhood T1DM is rising worldwide, with reported increases of 2 to 5 percent per year in Europe, the Middle East, and Australia. The most common presentation of childhood T1DM in most populations follows chronic polydipsia (intense thirst), polyuria (urinating often) and weight loss with hyperglycemia (high blood glucose) and ketonemia (excess of ketone bodies in the blood). Being very tired and blurred vision are also symptoms of this disease. In extreme cases, type 1 diabetes can also cause nausea or vomiting, belly pain, and panting. Measuring your blood sugar often, to make sure it does not get too high or too low. 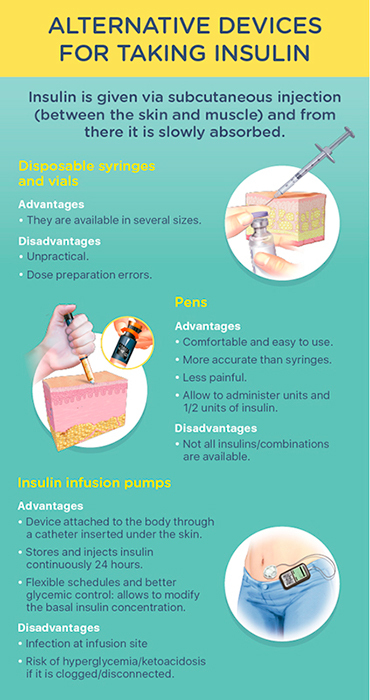 Using insulin shots or an insulin pump to keep your blood sugar levels in the right range. People with type 1 diabetes also need to carefully plan their meals and activity levels. Having low blood sugar can cause problems, too. It can make your heart beat fast, and make you shake and sweat. If blood sugar gets really low, it can cause more serious problems, too. People with very low blood sugar can get headaches, get very sleepy, pass out, or even have seizures. People with T1DM will probably need to see your doctor or nurse at least 3 or 4 times a year. Sometimes they will need more visits to learn how to manage diabetes or if their blood sugar is not well controlled. 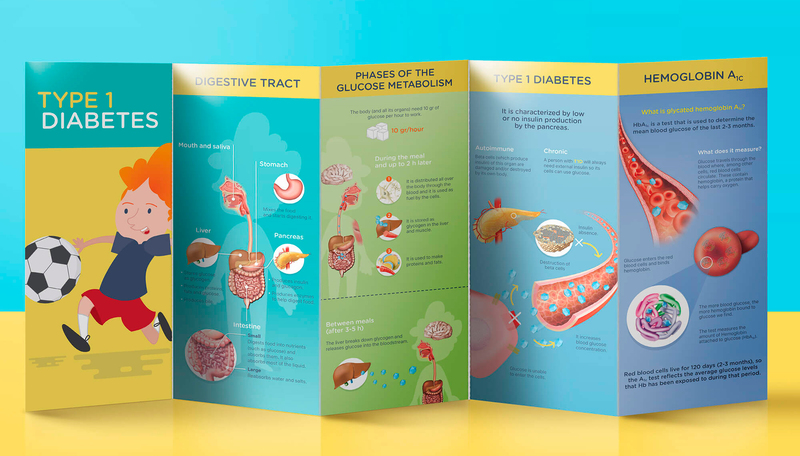 This foldout brochure consists of 17 panels of varied content including simple text and high quality medical illustrations that can be easily understood by the patient. If you would like to sponsor any of your diabetes drugs through this brochure, please contact us.